Sara Shookman visits her mentor, teacher Scott Ross. Everyone – from elementary school students to TV news anchors – needs someone to encourage them and guide them to success. And that’s why mentors are in the spotlight at WKYC during January, which is National Mentoring Month. For the rest of the month, we’re airing a series of commercials featuring real-life testimonials from local young people who were lucky enough to have a mentor’s support and guidance. And as we get closer to Jan. 31, which is National Thank Your Mentor Day, our anchors and reporters will be telling you about the mentors who helped shape their careers. 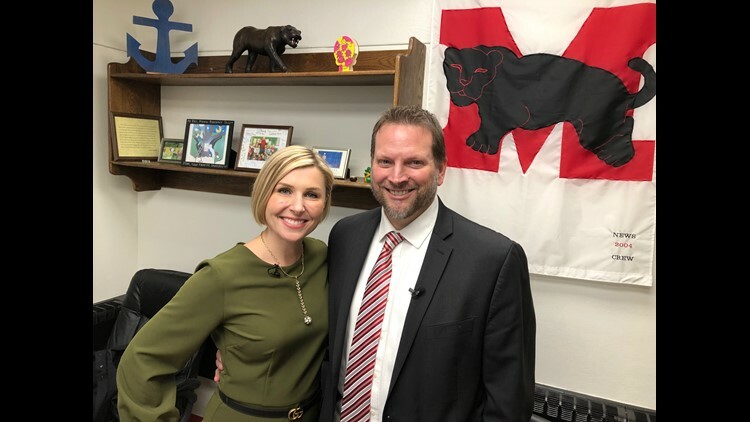 For both of WKYC’s evening anchors, it was a teacher that made the difference. Sara Shookman credits her seventh-grade reading teacher, Scott Ross (shown in above photo), with cultivating her interest in journalism. National Mentoring Month is an annual campaign, launched four years ago by MENTOR: The National Mentoring Partnership and the Harvard T.H. Chan School of Public Health. Big Brothers Big Sisters: Has a network of agencies in Cuyahoga, Lake, Lorain and Summit counties which matches children with caring mentors. Find your local organization at www.bbbs.org. Cleveland Metropolitan School District’s True2U program: After receiving training, volunteers become part of a small advisory group that meets with eighth graders at Cleveland schools nine times a year. Program helps students set goals and prepare for the transition to high school. Click here to learn more. College Now of Greater Cleveland: Via an online platform, mentors communicate monthly and provide advice to college students, most of whom are first in their families to attend college. Volunteers must be college graduates and make a four-year commitment. Click here for more information. Community of Hope: A unique mentoring model, this program seeks community volunteers to meet weekly and form a “board of directors” to advise a youth aged 18 to 27 who has aged out of foster care. More info available at www.hopecle.org.